More than 100 new species have been discovered in the ecologically diverse region of the Mekong river which stretches from the Tibetan plateau to the South China Sea, according to the World Wildlife Fund (WWF). 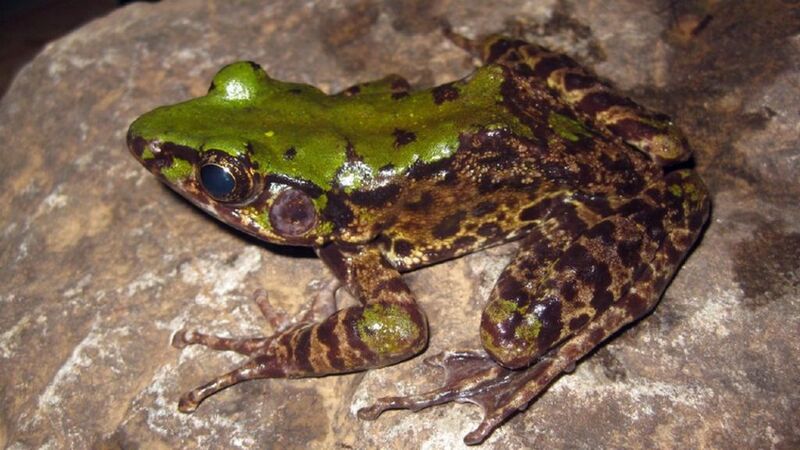 Odorrana Mutschmanni, a coloured frog, was found in a forest in north-eastern Vietnam - among 115 new species discovered by scientists in the Mekong region in 2016. This mole, called Euroscaptor orlovi, is one of two mole types found in Vietnam. According to researchers their underground dwellings have helped protect them. A mountain horseshoe-shaped bat called Rhinolophus monticolus was found by a scientist in a local market in north-eastern Thailand. New species discovered in 2016 include 11 amphibians, two fish, 11 reptiles, 88 plants and three mammals. This snail-eating turtle, called Malayemys isan, was also found in a local market - in north-eastern Thailand. Every year scientists announce dozens of new species discovered in the region surrounding the Mekong, which flows through China, Thailand, Myanmar, Cambodia, Laos and Vietnam. WWF says the manmade threat to the animals' habitats remains "massive" but the discovery of new species gives "enormous hope". The Vietnamese crocodile lizard (Shinisaurus crocodilurus vietnamensis), a scaly reptile, hails from northern Vietnam's forests. It has taken years to confirm its status as a separate subspecies of a reptile first found in 2003. This loach fish (Schistura kampucheensis) was among species discovered in Cambodia. WWF says that over the past 20 years more than 2,500 new species have been discovered in the Mekong region - roughly two discoveries per week.